Remember a couple weeks ago when I wrote about the website, WorldsWithoutEnd and the BookTrackr function? 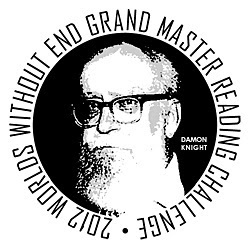 Well, the site also administers the Grand Master Reading Challenge, which I am participating in by adding to the site those reviews I've done here which also qualify for the challenge (2 so far). The challenge itself is pretty boss and the website in general is an HUGE resource for science fiction, fantasy and horror books. It is worth checking out in its own right. I have especially enjoyed using BookTracker to keep track of the books I've read and how many books I've read from various lists. I really spend too much time at this site. If that is not enough to get you over to this site, consider this: the two reviews I've contributed have been featured on their GMRC Blog and as such will be in the running for the monthly prize for the best GMRC review! To give you an understanding of how important this is I refer you to the challenges prize details. The winnning reviewer each month will receive prizes from the WWEnd prize box and everlasting glory. Participants who complete the challenge will receive a prize to be determined later. Prizes include: T-Shirts, buttons, books and bookmarks, etc. The swag is cool and I'm pretty excited about it, but I think you all know what I am really gunning for. EVERLASTING. GLORY. This contest is not just for play play; this contest is for realz. What is great is that any member of WWEnd can vote for that month's winner! This means you people. YOU! Voting has not yet begun (don't worry, I'll remind you) since February ends today but you should all take this brief period, prior to the initiation of the voting period, to sign up (for free) with WWEnd, start using BookTracker and get ready to vote me into the annals of Everlasting Glory. I'm gonna need to hear from you, readers, because the other reviews I'll be competing against are really freaking good. Wow. A prize to be determined later. You don't get swaggier than that. I'm okay with it. If the prospect of mystery swag is not alluring, I don't know what is. We saw this fact in the briefcase from Pulp Fiction. That's what that movie was about right? Mystery swag? Thanks for the great plug, Jeremy! Based on your reviews I think Everlasting Glory is within sight. There are 11 opportunities to win still to go so you'll have plenty of chances. @Julianne: Yeah, we have to keep the completion prize vague until we have a better idea how many prizes we'll have to award. For example, 80 T-shirts is going to be expensive but doable. If we get many more over the year we might have to scale back our plans. Thanks Dave! I should warn you that when it comes to me and flattery... it works.